Final Week of the 2010 Summer CSA! It has been an amazing season for us, and hopefully for you, too. We’re so grateful for the weather, our apprentices, our members, our families, our health… all crucial to the success of Hatchet Cove Farm. Lots of bulk produce is available for those of you who want to stock up your cellar for winter. Email us what you want, and we’ll let you know when it’s ready at the farm (or we can bring it to the Sunday delivery). Red and Yellow Storage Onions. 25 pound bags (to visualize, about the size of two basketballs) cost $30. Russet and Reba variety Storage Potatoes. 35 pound bags cost $40. Storage Carrots will soon be available. 15 pounds for $25 dollars. 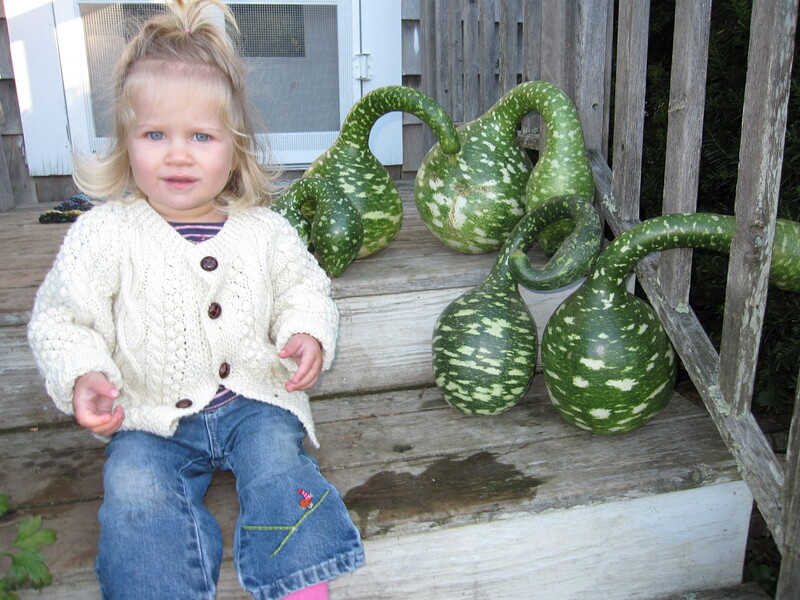 Winter Squash (Acorn, Delicata, Pie Pumpkin, Butternut, Carnival). $1/pound, your choice of quantity and variety. Kale and Chard are still available, both as pick-your-own (free) and pre-picked/bagged (10 bunches for $15). Basil also still available (till the first frost) as pick-your-own (free). One note about this week’s celery: don’t munch on it raw like the wimpy California stuff. This is strong, flavorful Maine celery, best chopped up (leaves and all) into soups and stews! them for a donation of around $5 to her ‘Peace Corp Fund.’ They will be available at both the Sunday and Monday pickup. If you get home delivery, just let me know if you want one and we’ll get it to you! Once they dry out they are great for birdhouses and other crafts. The short film that Pam Maus created about Hatchet Cove Farm (including many CSA member and apprentice cameos) can be seen here (http://vimeo.com/15603452). When the interview goes online, I’ll send that out, too. The HCF end-of-season survey is on-line at http://tinyurl.com/2010csasurvey. Please take a couple minutes to fill it out! There are still three spots available in the fall CSA, so let me know if you’d like to sign up (or send someone else our way — we do take new members for the fall). And finally, we hope to see you all at the farm potluck & cider-pressing & garlic-planting party! It will be Saturday, October 16th, from noon on. We’ll keep our fingers crossed for a beautiful day, but will reschedule via email if it looks like rain. Thank You, every last one of you, for helping make this an amazing season. We’ve loved being your farmers, and hope that you’ve loved being part of Hatchet Cove Farm. Have a wonderful winter, and we’ll be in touch in the spring! The family: Reba, Bill, Eli and Cecilia. The apprentices & wwoofers: Hanni, Laurie, Emma, Kelly, Katie, Tauhid, Margo, Erin and Ben. The long-term livestock we love: Mica, Sugar and Cookie.